It happens more often than most realize. You’re not able to heat your house due to a sudden malfunction, or you might get stuck in your car during a nasty snow storm. You might enjoy going on hikes in cold temperatures, but you could get lost or there could be a sudden dip in temperature. Sometimes you need to get warm, and you need to do it immediately. Don’t use standard equipment like flimsy socks or ones that only serve to maintain your temperature. Instead, buy the best gear to keep warm like these below that will boost your temperature. Here are 4 of the best options that will keep you warm when you need it the most. Simply put in a battery and get ready to feel the comfort of warm, snug socks. Not only helpful in the cold outdoors, battery powered heated socks are great for those experiencing poor circulation as well. Typical prices are around $40. Make sure you buy a pair of battery powered heated socks that say cordless in the description, and the battery should be placed in a comfortable location above the ankle. Heated socks. Any maker that places the parts near the underside, with any cords, has created an uncomfortable sock. That’s something you don’t want to deal with if you’re stuck on the side of the road, lost in the woods, or partaking in any winter sport. No one wants to walk around with a cord sticking out of their head. They’d just look silly. Now, there are fashionable and comfortable cordless heated hats on the market. Battery-powered, these hats often have multiple settings for different temperatures. For the hat I was looking at, on low, you can have a warm head for up to 5 hours, and on high, up to 2 hours. You can pick up a professional quality cordless heated hat for $99. Heated hats. Uniform heat is delivered to your feet with the best brands offering a remote to change levels, so you’re never too cold or too warm. No wires or extension cords are necessary for heated insoles. Simply slip them into your favorite shoes and then get moving. The batteries are lithium and ultra-thin. To save money, get a pair that allows you to recharge the batteries. Pick these up at around $70. Heated boot insoles. Long bouts of cold weather can leave my bones aching, especially in troublesome spots like my lower back. It can easily be treated with the purchase of a heated back wrap. 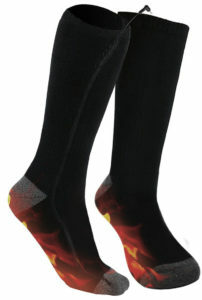 The heat will actually radiate up your spine and down to your toes, giving you an overall warm feeling. If you’re going on a long hike or camping, wrap this around your waist to keep your core warm. Often, hikers will only think about their head, their hands, and their feet, but they’ll forget about their core, which needs to be warmed too. You can get a heated back wrap for under $30. Heated back wraps. I will see people wearing winter-proof accessories, but the vast majority are inferior to what I’ve listed above. They only serve to keep you from freezing, but they won’t make you warmer. Don’t find yourself in an unfortunate, dire position where you need to get warm. These energy-powered devices will make sure you don’t freeze and they’ll keep you toasty.